This is a bit complicated to explain in just a few sentences, but there's a race against time going on in South Georgia, and helicopters are playing a key role. South Georgia, far down near Antarctica and east of the tip of South America, is a host to a number of rare birds including the lovely South Georgia Pipit. 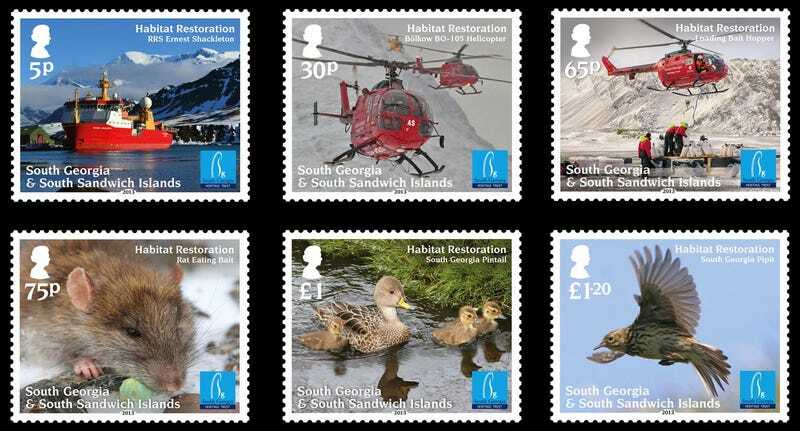 This Pipit (that's the little bugger in the lower right commemorative stamp) is interesting because even though it lives on a tiny speck of land in the middle of the frigid ocean, it's not a sea bird. It's sized like a little sparrow, deserted on this island. Here is where South Georgia is located, if you're curious. Now, the problem is that the South Georgia Pipit only lives on South Georgia, and there are rats on South Georgia. These rats are big enough to eat the little Pipit, and drive the remarkable bird to extinction. What's interesting is that rats came to the island since the 18th and 19th centuries on whaling ships. Why haven't the rats already killed off all the pipits? The excellent new blog (which ~disclaimer~ happens to be run by my own father Ben Orlove) Glacier Hub explains that it's all down to glaciers. The huge ice features divide up the island, and they're big enough that rats freeze to death before they make it all the way across them. The glaciers are like icy borders, in effect, sectioning off little Pipit sanctuaries. The problem with this is that the glaciers in South Georgia are melting, like the glaciers everywhere else thanks to climate change. In 2010, scientists figured out that the glaciers will eventually recede enough that rats will be able to reach the Pipits and kill them all. This set up a bizarre race against time: the rats have to get exterminated before the glaciers melt. Otherwise, the Pipits are done for. It's like a climate change version of Mission Impossible or something. There's really only one way to get rat poison (and enough of it) spread across the island in time: helicopters. Specifically, German-built Bölkow B0-105 helicopters. Their design traces back to the late 1960s, but these are some of the most maneuverable helicopters in the world. Red Bull uses them with some modification to fly upside down. Here's video of the Bo-105s arriving on the island in 2011 on the back of a cruise ship, then being deployed with bait and poison. These choppers have already dropped 230 tons of rat poison on South Georgia with great success, according to the South Georgian Heritage Trust and their team of biologists behind the project. GlacierHub explains how this extermination campaign can work without killing off all the Pipits along with the rats. The fact that the sections of the island are separated by glaciers means that the rats can be eradicated pocket by pocket without risk of previously baited areas becoming repopulated, and the organizers of the effort are confident they will be able to eradicate the rats from South Georgia. They have been fighting the rats for three years now, and hope to fully eradicate the invasive little bastards by 2025. The only question is if the glaciers will hold on long enough to keep the Pipits safe until then.